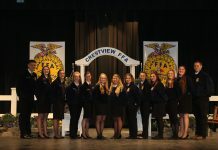 COLUMBUS — On May 2-3, four Firelands FFA members who were previously selected at state evaluation as the top four proficiency award finalists in the state, interviewed to determine final state placings. Earlier this year, 10 Firelands FFA’ers applied for 11 district awards. All 10 applications placed either first or second in the district, and all of the applications were ranked at the state level with five applications being selected as top four in state. Junior Amanda Spears, the daughter of Jim and Margie Spears of Wellington, placed second in diversified horticultural placement for her work at Hook’s Greenhouse. Jessica Zurcher, a senior and the daughter of Chris and Robin Zurcher of Amherst, placed fourth in state in outdoor recreation placement for her work at Common Grounds. Chrissy Balint, a junior who works at Dodd’s Hillcrest Orchard, and Emma Northeim, a senior who works at Rex Gee’s Orchard, and both applied for the fruit production placement proficiency. Balint, the daughter of Tom and Darlene Balint of Huron, earned second in state. Northeim, the daughter of Scott and Joy Northeim, won the state contest and will move on to the national proficiency contest. Jessica Zurcher won the poultry production proficiency award and will compete at nationals this summer. The members’ accomplishments set a school record for the number of state finalists and state winners. BERLIN, Ohio — Senior and first-year FFA’er David Yoder was named the Hiland FFA chapter’s member of the month for April. He is the son of David and Brenda Yoder, and is employed at Ruetenik Farms. His favorite FFA activities were the general livestock judging contest and going to national convention. He plans to attend The Ohio State University ATI (Agricultural Technical Institute) in Wooster. Past members of the month include Javan Scheufler, Grant Mast, Lee Shetler and Megan Hippert. BELOIT, Ohio — On April 30, West Branch FFA held its 46th annual FFA banquet, with more than 300 people in attendance. Star Greenhand awards went to Kaite Stowe, Sarah Biliter, Rod Headland and Kyle Wade. Outstanding sophomore awards went to Mikayla Hahn, Sarah Fraiser, Cody Maris and Casey Ruthrauff. Outstanding juniors were Ben Grammer and Heidi Miller. Outstanding seniors were Mike Douglas and Kyla Sharp. Ronnie Felgar received the chapter’s Honorary Farmer degree for his continuous support. The chapter’s new officers include: president, Ben Grammer; vice president, Mikayla Hahn; secretary, Sarah Fraiser; treasurer, Kira Sharp; sentinel, Joe Teague; and reporter, Katie Stowe.